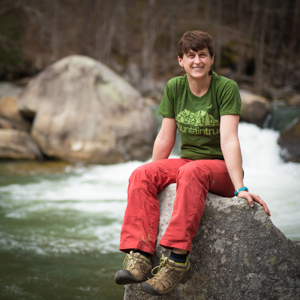 Susan is thrilled to serve as the Community Engagement Manager for MountainTrue where she is charged with connecting people all across the WNC region who are committed to protecting our natural resources. Originally from Atlanta, GA, Susan earned her B.A. in Religion from Davidson College, despite spending the majority of her time there running outdoor adventure trips with the Davidson Outdoors program. Following her passion for outdoor education, she next traveled out west to work for the National Outdoor Leadership School leading whitewater paddling trips in Utah, Colorado and Idaho. She returned to the Southeast to earn her Masters in Public Administration from the University of Tennessee in Knoxville, where she continued training wilderness trip leaders as a graduate assistant for the university’s outdoor program. In 2011 Susan moved to Asheville and applied her program and leadership development skills as the program director for Leadership Asheville for four years before taking her current position with MountainTrue. She is actively involved in the community serving as a member of CoThinkk and volunteering as a Big Sister in the Big Brothers Big Sisters program. In her free time, she loves trail running with her dog Mossy, road biking, and gardening.